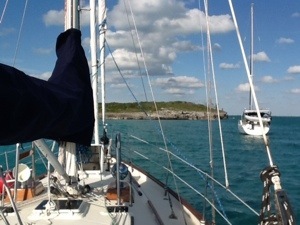 We left Hopetown Thursday morning and moved the boat to Little Harbor in preparation for the crossing to Eleuthera. Took the dinghy over to Pete’s Pub for a drink. A nice sand floor bar with a view of the Harbor. After visiting Pete’s art gallery it was back to the boats and dinner on Heeling Time. The wind was supposed to be out of the North so we anchored in The Bight of Old Robinson but the ocean swell made for a rolly night. We were under way at six this morning for the 60 mile crossing to Current Cut. We had 20 knot winds behind us and 4-6 foot seas so it was a quick trip. I saw 9.8 knots once as we surfed down one of the waves. The fast trip enabled us to get to Current Cut at slack current (almost) so it was a calm trip thru. We are now anchored in a little cove South of Current Cut.